Property 6: Detached Cottage In A Rural Woodsy Neighborhood. Property 10: Located in the heart of New Orleans. Property 17: Live Like A Local In Historic Architecture! Property 20: le bon temps roulle...!! Property 25: PRIVATE TERRACE! ST.CHARLES AVE!!! GARDEN DISTRICT! Property 30: Cajun Getaway: "Home Away From Home"A little piece of paradise. Very relaxing. 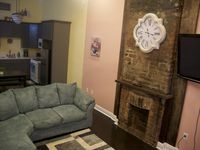 Property 36: Garden District Apt- 2 Blocks to Mardi Gras Route! Property 37: Charming Creole Caribbean in Mid City! Property 39: Clean and cozy apartment centrally located to everything! Property 43: New Orleans Home w/Patio - 2 Mi to French Quarter! Property 44: On Frenchmen Street - Whole House - With Courtyard! Property 46: PRIVATE BALCONY! ST.CHARLES AVE!!! GARDEN DISTRICT! Property 47: We're Jazzed Youre In Town!